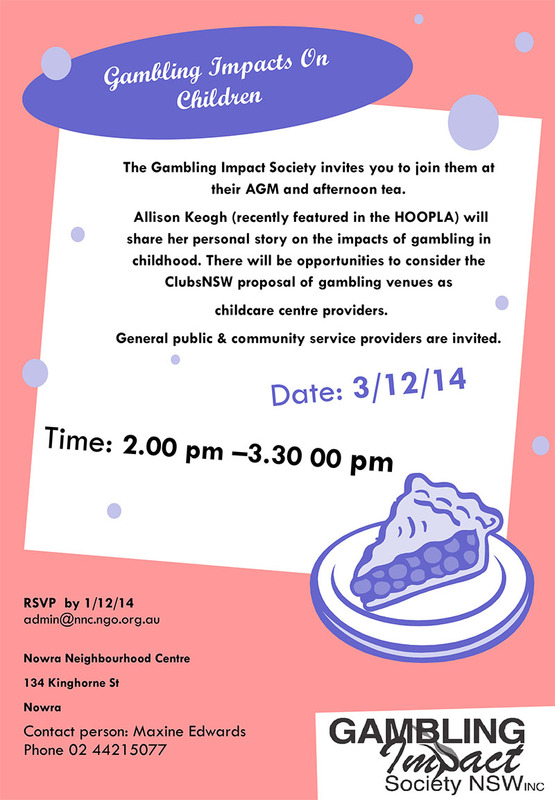 ARE YOU CONCERNED ABOUT THE NEGATIVE IMPACTS OF GAMBLING ON CHILDREN & YOUNG PEOPLE? All interested parties are invited to come along to our AGM to hear a powerful presentation by Allison Keogh who was recently featured on the HOOPLA and various radio stations talking about the negative impact of gambling on children and young people based on her personal experiences (see http://thehoopla.com.au/life-kid/ or http://www.4bc.com.au/blogs/2014-4bc-afternoons-audio-blog/jail-with-pink-walls/20141023-3ipo2.html). This should be of interest to anyone concerned about the impacts of gambling on children but also particularly relevant to parents, carers, childcare centres and children services. People may or may not be aware that Club NSW submission to the the recent Productivity Commission Inquiry in to ChildCare proposed that Clubs were best placed to provide aged care and child care services. We are concerned about this proposal and would like to promote some community debate around this proposal and the notion of gambling venues as providers of services to some of our more vulnerable community members. We are of course also interested in any nominations to join our committee for the next twelve months to help us work on this and other issues related to gambling in the community..